Kids think that the Internet is this place where they can say what they want with little regard to the impact their words have on other people. And yet, cyberbullying can go on 24 hours a day and have lasting impact on kids. Once, targets of bullying had to endure it only at school. Now, it can follow them home. For students who have been exposed to cyberbullying themselves, and for parents who have either been exposed to it or are seeing their child experience it, and for educators who have either been exposed to it personally or are seeing students go through the pain of it, here are some tips to help stop it or to prevent it from happening again. 1. Don't engage the person. If you are being "flamed" (the slang term sometimes used for criticism coming from the cyberbully), don't reply and don't engage the person doing this. It's a natural response to want to defend yourself, but you must bear in mind that you can never have a mature discussion with a bully. 2. Print everything out. Online communications are easily manipulated or edited. So, to make sure that the instance of cyberbullying is documented in case you need to reference it later, print it out. 3. Change your screen name. If you are being harassed by a cyberbully through the use of a certain screen name, then give some consideration to the idea of changing your screen name and sharing the new one which you have selected only with friends and family. 4. Don't share personal Information in chat rooms. Never give out personally identifiable information, such as name, address, e-mail address, or telephone number in public chat rooms or websites. 5. Identify the sender. Try to find out where e-mails are coming from. Right mouse clicking over the email address will sometimes reveal details with regard to the sender's identity. If you do manage to discover who it is who is carrying out the cyberbullying, get your parents involved. 6. Contact the service provider. 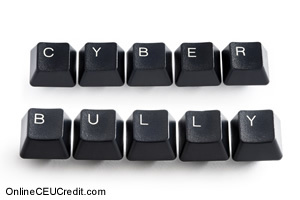 If you do manage to identify a cyberbully, you should let your Internet Service Provider know. Provide documentation of abuse and misuse of subscription services. 7. Think before you send. While it is definitely recommended not to engage with a cyberbully, in the event that you have to reply for some reason, make certain that you think before your write or send something, and never respond with abusive postings. In fact, always talk to your parents or a trusted adult before you respond. 8. Parents, get involved. As you would do with regard to other activities which your kids are involved in, know which online tools, applications, games, and other online material your children are participating in. In exactly the same way as you wouldn't send your children out to cross the street without preparing them with safety advice to "look both ways" before doing the actual crossing, make certain that your children are aware of the precautions which they need to be taking with regard to the online environment. 9. Teachers, get Involved. According to a source which calls itself Martial Arts for Peace, every seven minutes, there is a child being bullied. Adults are estimated to be intervening only 4% of the time. According to the Office of Juvenile Justice and Delinquency Prevention, bullying begins in elementary school, peaks in the sixth and eighth grades, and persists into high school. 10. Comprehensive action is needed. Bullying can interfere with learning and often leads to greater and prolonged violence. Research and experience suggest that a comprehensive action involving teachers and other school staff, students, parents, and community members is likely to be more effective than purely classroom-based approaches. Schools can be very effective brokers in working with parents to stop and remedy cyberbullying. Schools and parents can work together to educate students on cyberethics and the law. It is also recommended that a provision be added to the school's "acceptable use of technology" policy reserving the right to discipline a student for actions taken off-campus if they are intended to have an adverse effect on a student or they adversely affect the safety and well-being of a student while in school. For parents with a child who is being bullied, place and keep the computer in a common area. Inform the Internet Service Provider (ISP) or cell phone company of the abuse. Do not erase the messages; keep them for evidence. Use blocking software if possible. Parents should ask their school if it has a policy on cyberbullying and meet with school officials to discuss the situation. Learn what controls are available through the ISP. Have consequences in place if kids violate family rules on Internet use, especially cyberbullying. Parents should consider taking a course to bring themselves up to speed on computer use. Although adults must respect the privacy of children and youth, parents' concerns for their child's safety may sometimes override these concerns. They should tell their child they may review his or her online communications if they think there is reason for concern. Never let a known incident of bullying pass unchallenged and not deal with it. Choose a generic nickname. Most chat rooms ask participants to create a nickname. They should always use one that is generic or common and doesn't reveal personal details about themselves. For example, instead of using a nickname that identifies them and their whereabouts — like "BostonBob" — choose a generic one like "FootballFan." Participants must also make sure that their nickname is not the same one they use for their e-mail addresses. Be anonymous. When chatting, participants should never give out personal information that could identify them, such as their photo, real name, address, phone number, school, place of employment, Personal Identification Numbers (PINs) for their bank, credit card numbers, social security numbers, their pet's name, etc. Avoid private chats. Because many chat rooms are havens for sexual predators, parents should oversee their children's participation and keep them away from any chat rooms not moderated by trustworthy adults. Never meet in person. No matter how much participants enjoy talking to people in a chat room, they must never agree to meet them in real life. The risks are too great, and participants could become the victims of a serious or even deadly crime. Use filtering software. The best way to protect children from Internet predators who lurk in chat rooms is to install special software that filters and/or blocks undesirable web content. Some popular programs are Spector Pro (http://www.spectorsoft.com), Cyber Sentinel (http://www.securitysoft.com), and lamBigBrother (http://www.iambigbrother.com). What about instant messaging? Sending instant messages (IMs) to friends and family is a great way to stay in touch without costly phone charges. However, as with any Internet technology, there are several rules which parents and their children should consider to protect themselves and prevent their private information from being snatched by snooping criminals. Instant messengers must send and receive IMs only from people they know. Being selective about the people they talk to will prevent unwanted intruders from barging into conversations, sending viruses, or tricking them into clicking a web link inside an IM. IM senders must block strangers. They must configure their IM program in order to block messages from anyone who is not on their contact/buddy list. Senders seeking instructions on how to do this should consult the "help" menu in their IM software. IM senders must guard their identity. They must never give out their credit card numbers, social security numbers, website pass- words, security codes, IDs, etc. IM senders must remember that, unless they encrypt their IMs, the possibility exists that a criminal could intercept and read them. IM senders must watch what they type. They must be careful about the kind of private or sensitive information they transmit, for they have no control over what happens to an IM they send. Its recipient could copy the text and forward it to other people, making the IM sender's private information no longer private. IM senders must never click on links. They must never click on web links in an IM, even if sent by friends or family members. It is possible that an Internet virus or worm hijacked their computer and sent the IM sender a link hoping to infect that sender as well. IM senders must never open attachments. They may trust the person sending them an IM attachment, but they must not be lulled into a false sense of security. If a newly created virus is hiding in the attachment, it could slip past their virus scanner and infect their computer. Their best bet is to steer clear of all IM attachments. In public, IM senders must avoid auto log-ins. When using IM on a public computer, IM senders must make sure that they do not use the program's automatic log-in feature. This will prevent someone from accidentally or purposefully logging onto the IM sender's account. IM senders must use caution at work. Today, many companies screen the e-mail and IMs of their employees. If IM senders don't want their bosses to read their private messages, then they should wait and send them when they get home. IM senders must not forget to log off. When they are finished with an IM session, they must always log off. This is also true if they are going to be away from their computer for more than a few minutes. The process of logging off will close access ports on their computer and make it more difficult for Internet intruders to find a way into their system. IM senders must not be afraid to tell what has happened. If an IM contains words or pictures that are rude, mean, gross, or make the sender's children feel uncomfortable, they should close the message and immediately tell the sender or their teacher. IM senders must not ignore computer troubles. If the sender's children accidentally click a link in an IM or open an IM attachment and the computer starts acting strangely (such as running really slow, showing pop-ups when you're not connected to the Internet, or showing strange pictures), they should immediately tell the sender or their teacher, because the computer might have become infected with spyware or a virus. "Sure, you want to defend yourself, but you can't deal maturely with a bully." The preceding section contained information about student safety from cyberbullies, in chat rooms, and in instant messaging. Write three case study examples regarding how you might use the content of this section in your practice. What are three tips to help stop cyberbullying or to prevent it from happening again? Record the letter of the correct answer the Answer Booklet.